HOODELL Brand Advantage: HOODELL focus on Lawn & Garden equipment, guaranteed high quality and service, worry-free 90 days warranty. Check the size, compare your old air filter with our pictures to make sure the fitment.★ Extended Life Series: Soft gasket, better seal, Larger filter area, higher air intake than original, less rubber flash. Protect your engine, breathe better and higher gas mileage. 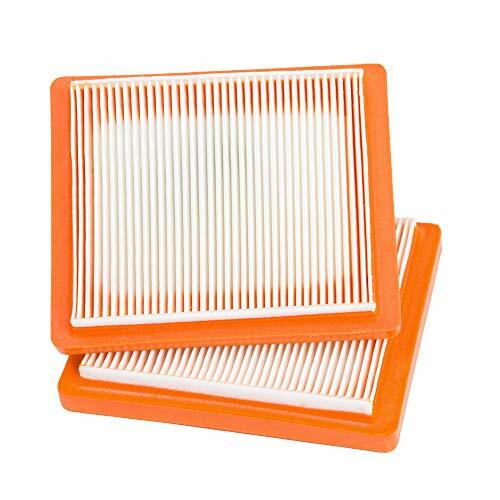 ★ Generic Model Air Filter: Replace manufacturer part number: # 14 083 15-S and 14 083 16-S, for Kohler XT650 Courage XT Toro MTD Lawn Boy mower, XT675 XT6.5 XT6.75 lawn mower engines. ★ Wide Use Parts: Compatible Kohler XT650-2017 Hop, XT650-2020 Country Home Products, XT650-2022 engine. Also for Kohler XT675-0041 Toro motor, Kohler XT675-2034 Toro Recycler lawnmower. ★ Durable and suitable: Sturdy material, especially against heavy dust and weeds without issue. Exact size, easy to install, fit like a glove. Mower running much better, comfortable throughout the whole season. ★ What You Get: 2 pack excellent air filters, worry-free 90 days warranty, our friendly and prompt customer service. Worthwhile to choose!